Learning when to enter a trade is just one step of becoming a successful trader. It’s just as important that you have a plan on where you will exit your trade when things go wrong. For this we use a stop loss order. A stop loss order is a trade placed with your broker to sell a security when it hits a defined price. Stop loss orders help to to limit you potential losses when a trade goes against you. When you are long a position a stop loss order will execute a sell order when price drops to your stop price taking you out of the position. If you are short a security a stop loss order would trigger a buy order at the defined price. It’s important to note that price is not guaranteed when using a stop loss order. It’s actually quite common to be filled at a worse price than you’re defined stop loss price due to liquidity. Hopefully you thought this heading was crazy when you read it…because it is. Trading without a stop loss is the ultimate recipe for disaster. Anyone who makes an argument for not using a stop loss order is most likely not a very successful trader. Some will argue that fear causes them to place their stops too tight so they don’t use them. That may work for a while… Up until they enter into a position that moves drastically against them due to news or illiquidity and they will end up getting crushed on one trade as they constantly look for a bounce to get out of their position. When you’re trading the only time you have complete objectivity is prior to entering a trade. Once you are in the trade you begin to lose your objectivity due to emotions. This is why it’s imperative that you not only use a stop loss but determine your stop price prior to entering a trade. I can still hear Art, the founder of GPC, walking around the trade floor and asking traders stuck in losing positions where their out was. Time and time again these traders would be like a deer caught in the headlights, without an answer…simply hoping. There are two types of stop loss orders, stop orders and stop-limit orders. Let’s take a look at the difference in the order types. Sell-stop orders protect your position by triggering a market order to sell if you’re long when price falls below a defined level. A buy-stop order would protect a short position by triggering a market order to buy if prices rise to a defined level. When placing a stop order your execution is guaranteed but price is not. For example, assume Joe is long 1000 shares of ABC stock at $50 per share. He wants to exit the trade if price falls to $45 so he places a sell-stop order at $45. Price declines and hits the $45 level at which point his market order would be triggered to sell 1000 shares. Joe might get filled 500 shares at $45 and the remaining 500 shares at $44.50. Where you will be filled depends on the time you placed the order, the liquidity of the security, and your position size. Similar to a stop order, the purpose of a stop-limit order is to minimize losses but as the name states there is a limit at which your order will be filled. Stop-limit orders guarantee price but not execution. There are two prices defined when using a stop-limit order. The stop price is the price at which the order will be triggered and the limit price is the price that the order will be filled at or better. Obviously there is no guarantee this order will be filled especially in highly volatile or illiquid markets. For example, lets assume Joe is short 1000 shares of XYZ stocks at $30 per share. He places a buy stop-limit order at $35 with a limit price of $35.50 to exit him from the position. XYZ begins moving up against him and hits $35 per share at which point his limit order to buy at $35.50 is triggered. The risk Joe is taking is that if the market is illiquid and moves above $35.50 before he is filled he won’t be filled until the price drops back down below $35.50. As a day trader I only use stop orders. Yes I may be filled at a worst price, but I’m always looking to limit my risk. I place my stop orders at prices that prove to me my position is wrong. I’m not in the game of hoping so I’d prefer to exit the position no matter what the price. Stop-limit orders are typically used by long term investors who are actively monitoring the market. News releases may drastically move a security that fundamentally they believe in holding long term. Lets review some of the most popular stop loss strategies. Implement any of theses techniques to help mitigate your trading losses. My least favorite of all stop loss strategies. A standard stop order is always set at a fixed price and doesn’t take into account account market volatility nor does it move during the trade. Either your take profit is hit or you will be stopped out at your intial stop price. For example, you decide to go long Facebook (FB) at 130.20 with a 15 cent stop loss. As you can see your stop would be at $130.05 and is fixed there throughout the trade. Either you hit your take profit or you will be stopped out for a 15 cent loss at $130.05. A fixed trailing stop will automatically move your stop loss by a fixed amount that you define as a trade moves in your favor. Your position must move a certain amount of ticks/pips/points defined by you in order for the stop to move. For example, you go short Facebook (FB) at 117.30 with an initial stop of 20 cents with a fixed step of 10 cents. 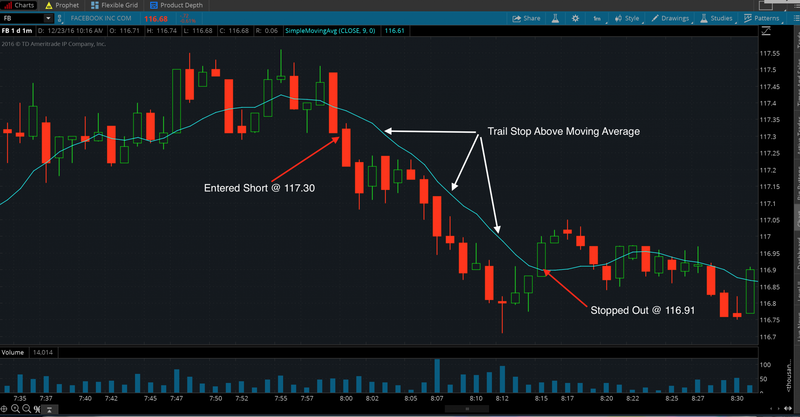 Similar to a fixed trailing stop, a dynamic trailing stop automatically moves your stop as your position goes in your favor. However, with a dynamic stop your stop loss will move for every tick/pip/point that the market moves in your favor. As seen on the chart above, your stop loss begins to move down by 1 cent for every cent Facebook moves in your favor until your stop is hit. 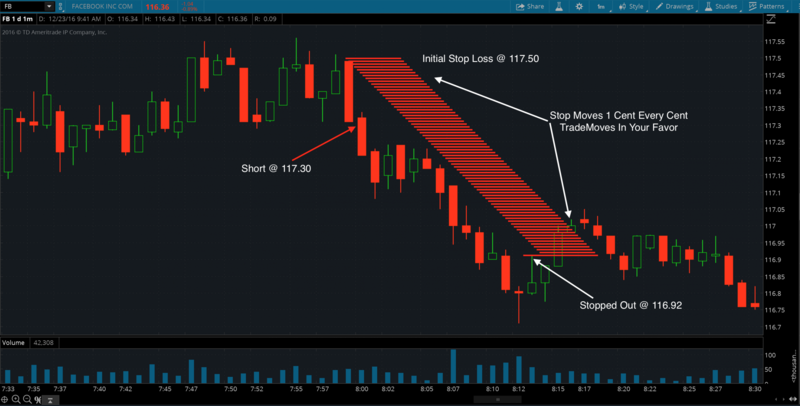 This trade hit a low of $116.72 which moved our stop down to $116.92 at which point the market bounced and took you out of the trade. This is personally my favorite stop loss management strategy. Market volatility changes and using swing highs and lows to manage your stops allows you to appropriately react to that volatility. Swing highs are the peaks reached on a security when the high of a price is greater than surrounding price action. A new swing high is made when price breaks down to new lows. When a security is making Lower Highs and Lower Lows the security is in a downtrend. Below are some examples of swing highs. Swing lows are the troughs reached on a security when the price is lower than a given number of lows positioned around it. A new swing low is made when price breaks out to new highs. When a security is making Higher Highs and Higher Lows the security is in a uptrend. Below are some examples of swing lows. In the image below you can see how you would use the swing low for your stop loss when going long and the swing hight for your stop when going short. You can also move your stop loss similar to a trailing stop when a new swing high or low is created as seen on the chart below. You entered short once again at $117.30 with your initial stop above the swing high. 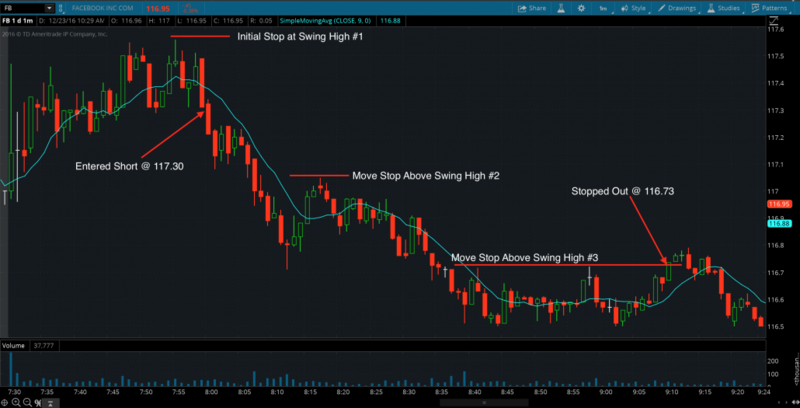 As new swing highs are created you manually continue to move your stop loss order above the swing high until a swing high is hit. On this trade you would of been taken out on the break of the third swing high at $116.73. Using moving averages are another great way to manually trail your stop loss. Once again you go short Facebook at $117.30. You manually trail your stop below the moving average (blue line) until price breaks above. On this trade price broke above the moving average at $116.91 taking you out of your position. Have an out…and USE IT! Always make sure your stop loss was filled. Don’t just assume. Determine your stop loss prior to entering a trade while you still have complete objectivity. Never move your stop once in a trade unless you’re moving it in your favor. Remember that stop orders guarantee execution where as stop-limit orders guarantee price. Use trailing stop orders to remove emotions from a trade helping you stay in trending trades longer. As traders we are constantly trying to gain an edge over the rest of the market. Properly mitigating your losses helps put you one step closer to having that edge. Now that you’re a stop loss guru try some of these strategies with your current trading strategy. Let me know how they work for you! Risk management is the most important topic you will ever learn about when it comes to trading. Improper risk management is the number one reason why most new traders fail. This guide outlines what risk management is as well as some useful risk management techniques for Stock, Futures, Forex and Option traders. Risk management is the process of analyzing and mitigating losses in your trading. In more basic terms, it’s the number one thing that will determine your success or failure as a trader. Trading is probably the world’s only profession where the rank amateur has a 50/50 chance in the beginning. You can have short-term success by pure luck and that fools people. Being successful long term requires a number of attributes and one of them is having a solid risk management plan. If you trade without a risk management plan you’re simply gambling, and in the long run most gamblers lose. To be profitable as a trader how often do you need to be right? I’ve asked this question hundreds of times in the past at training workshops and seminars. The general consensus is somewhere between 60% – 75%. The lowest answer I generally get is around 55%. All of these are wrong. You could be right 30% of the time and still be a very successful trader. It all comes down to your Reward to Risk Ratio. The ratio analyzes the amount of risk you take on given versus the return from the expected profit. This ratio is calculated by dividing the amount of profit you expect to make to make on a trade (the reward) by the amount you stand to lose on a trade if the price goes against your position (the risk). 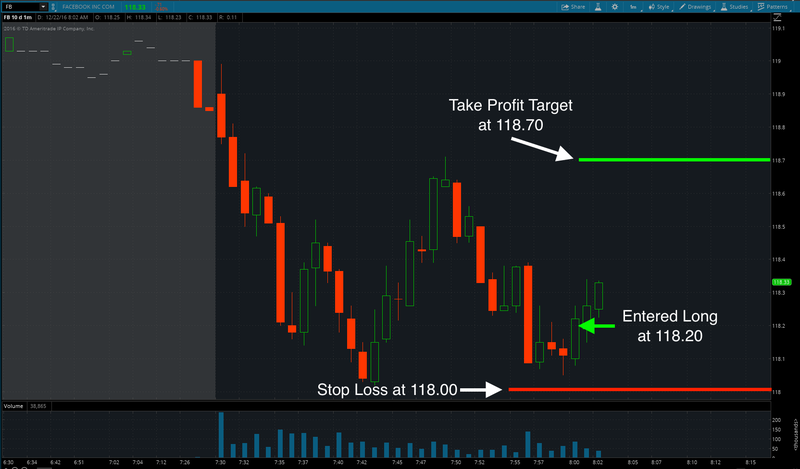 For example, let’s assume we go long Facebook at $118.20 with a stop loss set at $118.00 and a profit target of $118.70 as seen in the chart below. On this trade we would be risking 20 cents to potentially make 50 cents. Now that you understand how to calculate your Reward to Risk Ratio let’s take a look at how often you need to be profitable as a trader to be successful…. As seen in the chart above, you could have a win percentage as low as 30% yet still be profitable if you were using a 3 to 1 reward to risk ratio. I wouldn’t suggest trading a system that has a win percentage of less than fifty percent especially if you’re a new trader. Most people can’t handle the drawdowns and psychological effects of trading a system where you only win 3 out of ten trades. Typically it will lead to erratic behavior and poor decision making. I have traded with some of the best traders in the world throughout my career and typically they target a win percentage of 60 percent to 70 percent on the high end with a minimum Reward to Risk of 2 to 1. Calculating your Reward to Risk ratio should always be your final step before taking a trade. No matter what strategy you trade not all setups are created equal. Some will expose you to more risk than necessary and should be trades that you avoid. You don’t have to calculate the ratio down to the exact decimal point prior to entering a trade. You simply need to calculate a fast rough estimate ensuring that you’re above what you set your minimum reward to risk to be. NEVER enter into a trade without having defined exactly where your stop loss is going to be…plain and simple. You have to know exactly where you’re getting out before you get in. You make that decision prior to entering a trade while you still have objectivity. Once you enter a position you will lose some of your objectivity. Not defining your stop loss prior to entry will result in erratic decision making and ultimately larger than necessary losses. I personally prefer using physical stop loss order than a mental order (saying you will manually close out at a given price). Manual stop losses can be missed and lead to blow ups. Never change your stop loss unless you’re moving it in your favor. Developing a game plan for your position size is something that most trader never do. Typically traders will determine their position size at the time of taking a trade depending how they feel about a trade…not a good idea. Position sizing should be determined what your standard amount you risk per trade is and second your recent trading performance. If you state in your trading plan that you will risk 1% per trade you should do just that…on every trade. The only time your position size should change is if you’re cutting back on your size due to a recent losing streak or due to market factors like low liquidity or volatility. So how much should you risk per trade? Ultimately it comes down to how large of a drawdown you can psychologically handle while maintaining a cool head. Most people think they can handle a drawdown of 30% or even greater. Having taught thousands of traders I can tell you this simply isn’t the case. Typically traders begin to make erratic decisions and stop following their trading plans after hitting a 10 to 15 percent drawdown. If you’re new to trading I suggest you never risk more than 1% on a given trade. If you are consistently profitable and have been trading for some time you can increase this some but I would never go over 2% of your account balance. You can see on he chart above that as you lose more money it becomes even harder to get your account back to break even. 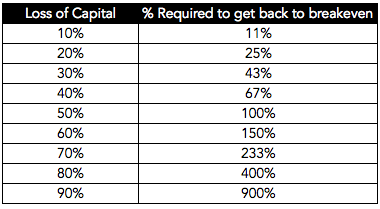 If you think you will be able to handle a %50 percent drawdown think again. Not only would it require extreme discipline and a strong mind, but you now have to make a 100% gain to get back to break even! By now, I hope you have it drilled in your head that you must avoid the temptation to trade larger than your account balance justifies. Doing so will put you ahead of most traders and the ability to survive your losing streaks. Becoming a successful trader requires you to accept that losing is part of the business. The best traders in the world still have extended drawdowns. Sometimes they can last for weeks or months prior to getting back to break even. When you have a drawdown, which you will, what are you going to do? If you don’t have an precise answer to this question then you need to formulate one prior to taking another trade. I have learned over the years that statistically I would have been better off if I stopped trading for the day after three consecutive losses. For newer traders I suggest you stop trading for the day after two consecutive losses. You also need to know your “uncle point” when it comes to consecutive losing days. If I have two consecutive losing days in a row I cut my position size in half. If I’m negative on the third day I take the rest of the week off. There will always be more trades to take. The question is will you still be trading and have the opportunity to take them? 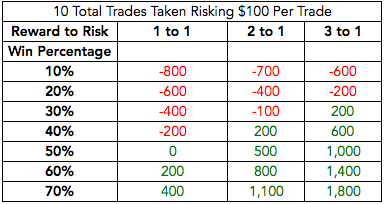 Calculate you risk to reward ratio prior to ever entering a trade. Never risk more than 2% on a trade. Stop trading for the day after two consecutive losing trades. Stop trading for the week after back to back max down days. Two losing days trading in a row cut your position size in half. Never place money into your trading account that you can’t afford to lose. Use the Risk to Reward ratio to invalidate certain trade setups. ALWAYS use a stop loss and define the exact price prior to taking a trade. “Here’s how I think of my money – as soldiers – I send them out to war everyday. I want them to take prisoners and come home, so there’s more of them.” Kevin, O’Leary. This quote from Kevin pretty much sums up how you should think about risk management. Precisely define your reward to risk setups, position size, and max drawdown and then FOLLOW it! Do this and you are 90% of the way there. 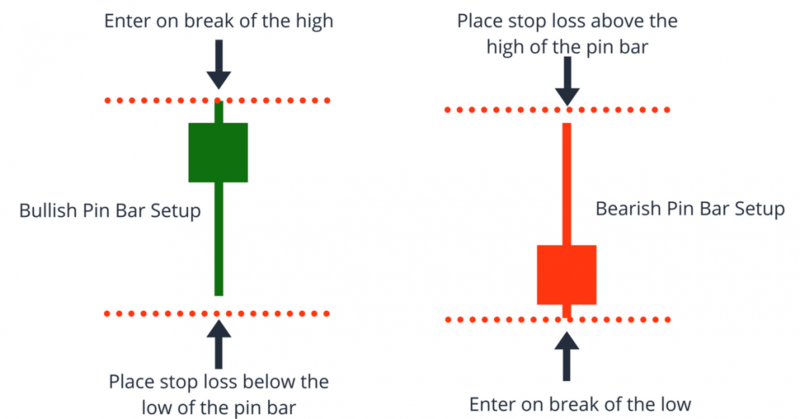 A Pin Bar is an extremely simple yet powerful pattern to implement into a trading strategy. They are used by are price action traders to determine potential reversals in the market. Pin bars can be very high Reward to Risk setups when traded properly. Let’s dig into the characteristics of a pin bar and discuss a few pin bar trading strategies. A pin bar is a single candle stick with a long tail (also called wick or shadow) and a small body. You can find pin bars using a bar chart or candle stick chart on any time frame in any market including Forex, Stocks, Futures, and Options. Most price action traders prefer the use of candle stick charts over bar charts as they are easier to interpret extremely fast when having to make split second decisions day trading. A pin bar is most recognizable by it’s tail. A valid pin will have a tail whose length is two thirds or more of the entire candle. The “body” or “real body” of a pin bar is the area between the open and close of the candle. The open and closing price should be very close together or equal (same price). 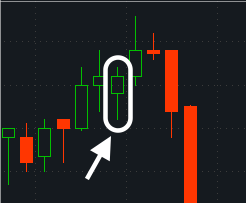 Bullish pin bars are best when the close of the candle is higher than the open. Bearish pin bars are best when the close of the candle is lower than the open. The tail of a pin bar should exceed (or stick out past) surrounding price action. Below is a 1 minute chart of Facebook, we can see numerous pin bar formations that would have resulted in profitable trades. Notice how all the pin bars extend below the previous price action confirming a rejection of lower prices. Do you notice what all of these pin bars have in common? If you guessed that they are all Bullish Pin Bar Setups you’re right! Can you spot some of the bearish pin bar setups on the chart? Imagine yourself above entering a maze. You have only two options, to go left or right. You begin by going left and after a period of time you start to question if you went the right way. Eventually you decide to turn around heading back to your starting point. When you reach your starting point you once again have two options, go back the way you just came or journey on in the new direction. Some people will second guess their decision and head back the way they just came from to go a little further and see if it’s the right direction. However, a majority people will continue on in the new direction. If we flip the maze vertical and place a pin bar along our path it paints a picture of where we had been and where we currently are. The open and close of the pin are both near your starting point. The tail of the pin bar shows the path you traveled and where you decided to turn around to head back to the starting point. Most people would look at this and expect price to continue to move up and more times than not it will. There are number of different pin bar formations you can trade. I personally generalize them all as pin bars but for those of you perfectionist here is a breakdown of the different types of pin bars. 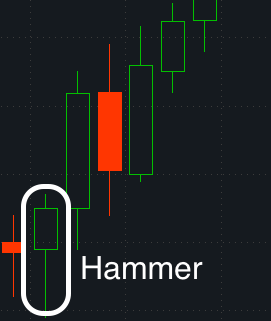 The Hammer is bullish reversal pattern that forms at the end of a decline in price (downtrend). Sellers held control during the beginning of the session of the candle but by the end buyers had stepped in and driven price back above the open of the candle. The end result is a candle with a long lower tail or wick which will exceed below the most recent price action. Hammers have the highest probably of success when the open is higher than the closing price. 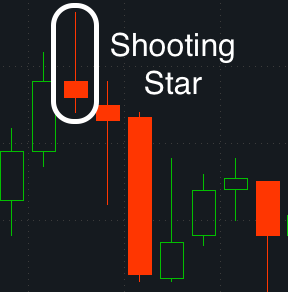 A Shooting Star is bearish reversal pattern that forms at the end of an advance in price (uptrend). Buyers maintained control during the beginning of the session but by the end sellers took over and drove price back down below the open of the candle. The resulting candlestick will have a long upper tail or wick which should extend out above recent price action. Shooting stars have the highest probability of success when when the closing price is below the opening price of the candle. 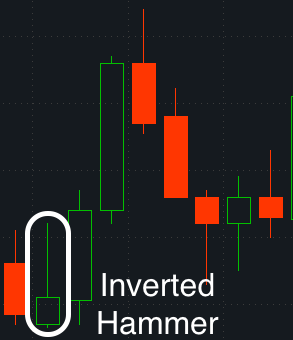 The Inverted Hammer looks exactly like a shooting star but forms after a downtrend in price. The long upper tail signals a potential reversal as buyers began coming back into the market they gave back ground to the sellers before the candle closed. Because of the failure to close out the session of the candle strong you should always look for bullish confirmation prior to entering a position. 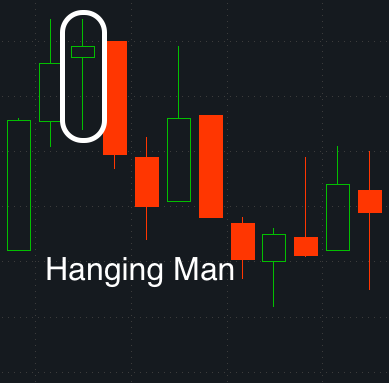 The Hanging Man looks exactly like a hammer but forms at the end of an uptrend in price. The long lower tail signals that sellers controlled the open of the candle prior to buyers stepping in and pushing price backup. Similar to the inverted hammer, you need further confirmation due to the failure of the candle to close out the session weak. 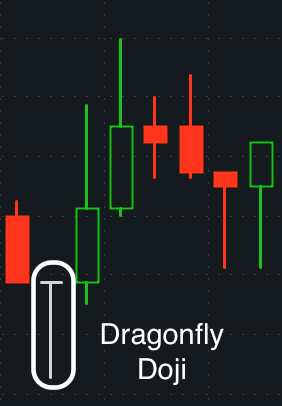 A Dragonfly Doji is similar to a hammer but with a dragonfly the open, high, and close are all equal. 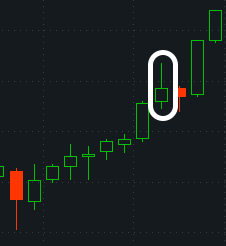 The candle forms the shape of a “T’ signaling that sellers controlled the beginning of the session before buyers stepped in and pushed price back up to the opening price. The reversal implications of a dragonfly depend on previous price action. 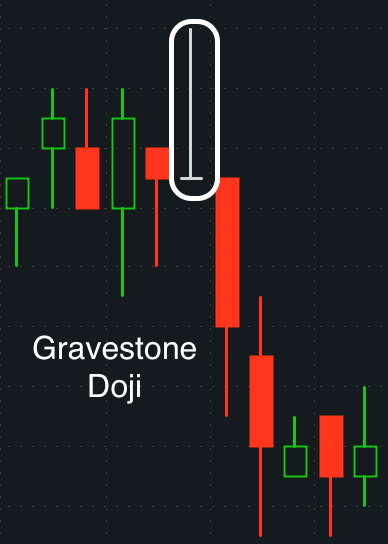 A Gravestone Doji forms when a candle has a long upper tail and the open, close, and low are all equal. 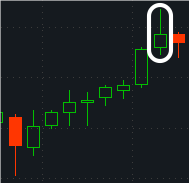 Similar to a dragonfly doji the candle forms a “T” but it is inverted. Pin Bars alone are not trading strategies and the reversal implications of any pin bar depends on prior price action. You should always look for additional confirmations prior to taking a pin bar trading setup. On the chart below you can see a key support level had formed on the E-Mini S&P 500 Futures. Price action failed to break below the key support level and on its third attempt a bullish pin bar formed. On the third attempt to break the support level the pin did break through momentarily, but buyers came in and pushed price back up closing the session out at it’s high. This gives you a high probability setup as a number of sellers are now caught selling at the lows which will most likely help add to the bullish. 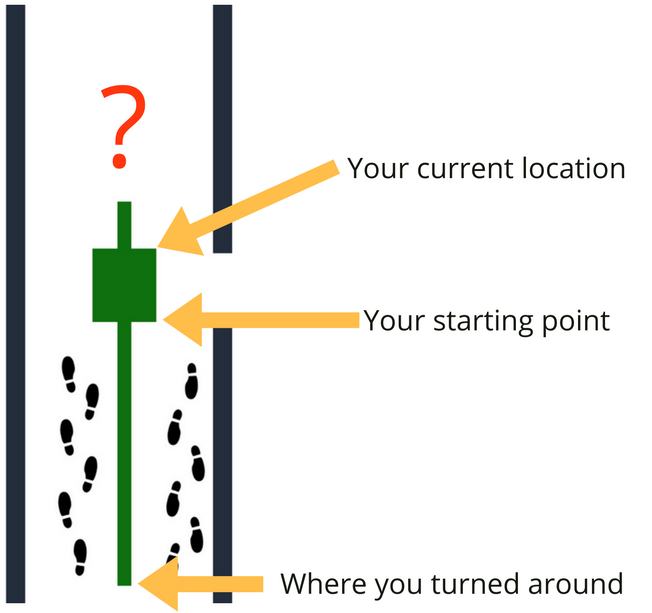 Pin pointing when to enter a trade and where to place your stop loss is just as important as the trade setup itself. Pin bar setups give you some very logical places to enter and exit a trade. Breakout Strategy – Enter on breakout above the high of bullish pin bar or the low of a bearish pin bar with a stop loss below the low (bullish pin bar) or above the high (bearish pin bar). When using the breakout strategy you can use a market order but I suggest a stop order as price action can be extremely fast after the formation of a pin bar. A stop order will help ensure you don’t miss out on your entry. Placing your stop below the low of a bullish pin bar and above the high of a bearish pin bar logically makes sense. Remember you are looking for pin bar setups where the tail extended beyond prior price action. 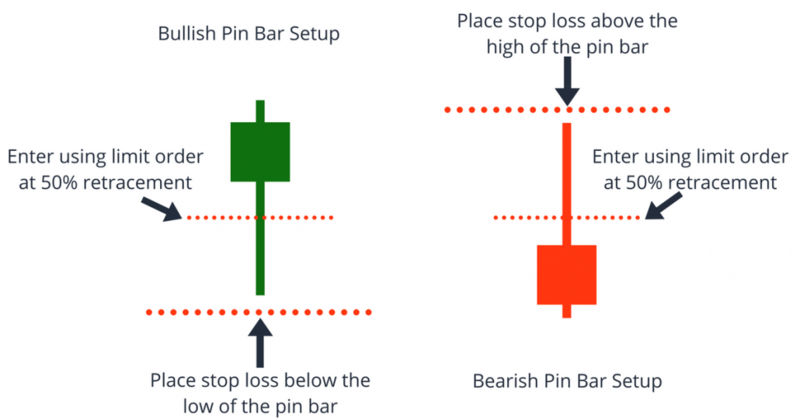 Therefore placing your stop beyond the tail of the pin bar means that price would have to make new lows or highs depending on the direction of your position to be stopped out. Retracement Strategy – Entry at 50% retracement of pin bar with stop loss below the low (bullish pin bar) or above the high (bearish pin bar). When using retracement strategy you will miss out on some moves but your risk to reward becomes much greater as you are now only risking half when compared to the breakout strategy. You measure the 50% retracement of the pin bar and place a limit order to buy for long setups and a limit order to sell for short setups. Your stop loss would be placed in the same way as the breakout strategy. The number one mistake traders make when trading pin bars is taking setups where the tail does not exceed previous price action. The pin bars highlighted in the chart above would be an example of an invalid signal. Remember, we’re looking for a reversal in the market and the exhaustion of a move. This setup doesn’t occur at the end of a down move nor does the tail extend out past previous price action. The second mistake traders make is simply trading a pin bar without any further confirmation. In the chart above we see a nice bearish pin bar form during an uptrend signaling a potential reversal. However, we don’t have any additional confirmation such as the rejection of a resistance level. Jumping forward we can see that trading this pin bar would have resulted in a quick loss. Remember to always have additional confirmation! The final mistake most traders make when trading pin bars is taking trades prior to determining their stop loss and take profit. You need to do this prior to entering a trade while you still have complete objectivity! Once in a trade you tend to lose your objectivity which leads to unnecessary mistakes and losses. 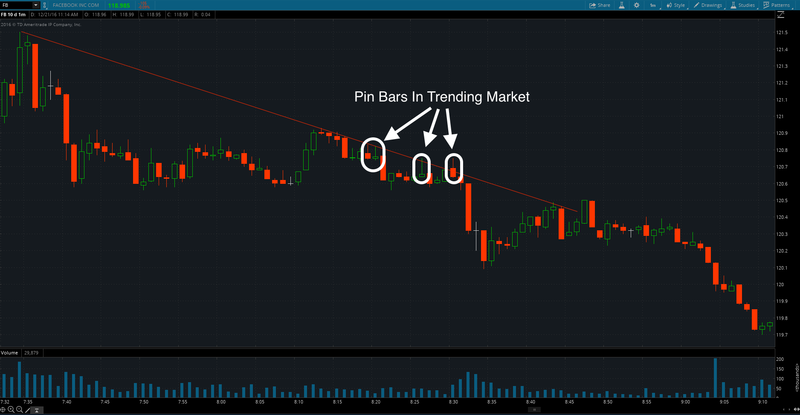 Pin bars often signal major reversals in a market. 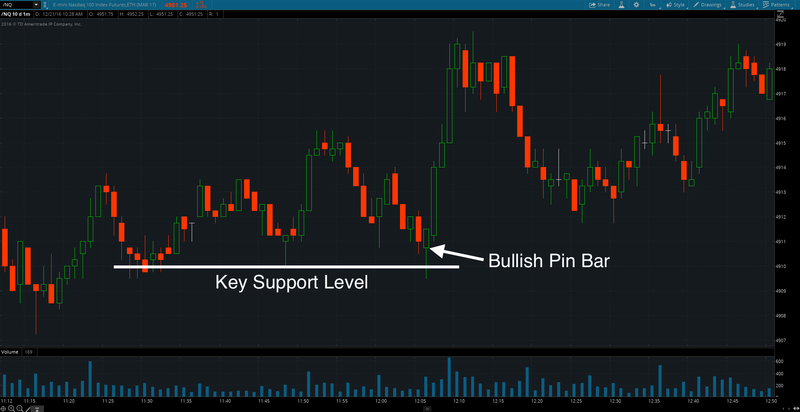 You can use pin bars not only as trade setup but you can implement them into your current strategy as another confirmation for taking a trade. Not all pin bars are created equal. Pin bars with longer tails tend to be higher probability setups. They also tend to see more of a retrace before the trade actually develops making them a better candidate for the retracement entry strategy discussed earlier. Remember to always calculate your Reward to Risk prior to entering a trade. I aim for pin bar setups with a minimum of a 3:1 Reward to Risk ratio. 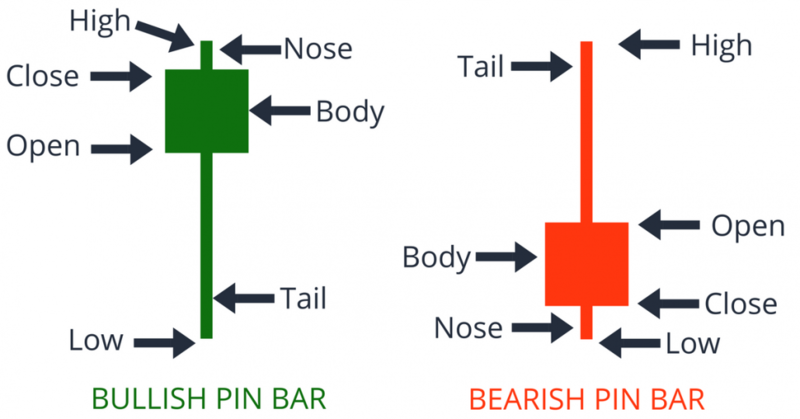 Pin bars are effective reversal signals in any market including Forex, Stocks, Futures, and Options. Make sure to spend time back testing and trading pin bars on a simulated account prior to live trading. So there you have it! That is a quick dive into how I use pin bars with my own trading strategies. Thanks for reading, and I really hope you enjoyed it. Start testing trading pin bar setups and let me know how it goes! 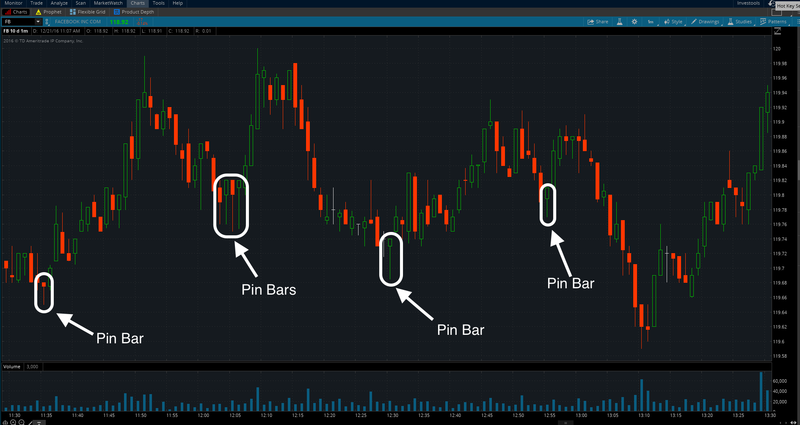 (NOTE: Want to learn exactly how I use Pin Bars to trade? Become a JT Member for Free. Click Here.